The refreshingly sweet and tangy tasting dark brown colored pulp found in the flesh of mature tamarind is enough to freshen up the sweet childhood memories. Plus, the black shiny seeds left after chewing the delectable pulp remind one of the various games played with them thereafter. Surely, there must be some of you who would still have those precious seeds hidden in some corner of the wardrobe. One of the most loved and savored snacks for kids; tamarind is used in a number of recipes for its unique sour, acidic taste that enhances the overall taste and flavor. Though this sour-on-young and sweet-on-mature yielding fruit is a common flavoring agent and condiment spice in South Asian kitchens, the pulp is also used for preparing various desserts, like jams, syrups and sweets. Tamarind is derived from the brown pods of the large evergreen tamarind tree, found in the tropical regions of the Indian subcontinent, Southeast Asia and West Indies. Each brown pod or bean contains a number of black seeds and sticky pulp, known for its typical aroma and taste. It belongs to the vegetable order though it is treated and consumed like a fruit. It is this pulp that contains all the nutritional and health benefits of the tamarind fruit. 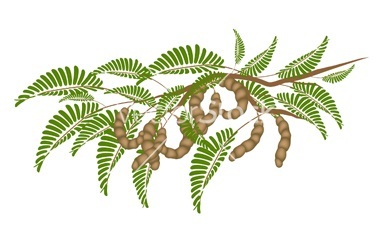 Read on to find the beneficial nutrients present in tamarind. A native of tropical Africa, especially Sudan, tamarind grows extensively throughout the Indian subcontinent, Southeast Asia and West Indies. But it was the Ancient Egyptians and Greeks who first cultivated it. Though it is not known when tamarind was introduced to Asia from Africa, but the credit goes to the Arabs who traded it to India and named it as ‘tamar’ in Hindi, which means ‘date of India’. For this reason, India has been popularly associated with the origin of tamarind due to its Indian name. In the 16th century, the Portuguese introduced tamarind to the East Indies while the Spanish explorers took it to the Philippines. The colonists distributed tamarind to the Americas during the 17th century where one can see large plantations in South and Central America today. While India is the largest commercial cultivator of tamarind, it is also produced in Mexico, Sudan, Thailand, Taiwan, China, Cameroon, Nigeria and Tanzania. A good source of antioxidants, especially vitamin C, flavonoids, carotenes, vitamin B complex and others, tamarind is highly useful for fighting against the damaging effects of free radicals and preventing the risk of cancer. Including tamarind in your regular diet can help in overcoming the deficiency of vitamin C, thereby improving and strengthening the immune system. The tamarind pulp in an excellent source of potassium which is essential for controlling the effects of sodium in the body, thereby regulating the heart rate and blood pressure. Tamarind is a storehouse of antioxidants that combine to promote a healthy cardiovascular and respiratory system. Besides, it is also enriched with carotene and aids in lowering bad cholesterol levels. Tamarind juice acts as a tonic, carminative, antiseptic, cleaning agent and febrifuge. As a result, the extract alleviates habitual constipation and impaction of bowels; thus regulating the malfunctioning of intestines and other organs of digestion. The juice extract of tamarind is regarded as a mild laxative and digestive aid, significant for treating bronchitis and sore throats. Tamarind juice, when taken in the heated form, is an effective cure for conjunctivitis. What’s more, eye drops are made from tamarind seeds to treat dry eye syndrome as the seeds contain polysaccharide which is adhesive and sticks to the surface of the eye for longer durations compared to other eye medications. Being acidic in nature, tamarind is a refrigerant and a febrifuge which fights against fevers and protects against colds. The fever temperature can be brought down by infusing one cup tamarind pulp in one quart boiling water and steeping the mixture for about one hour. Dilute some honey and drink it tepid. Diluting tamarind juice with lemon, milk, honey and dates serves as a digestive aid and as an effective cure for biliousness and bile conditions. A mild decoction of the pulp, when given to children, helps in eliminating worms and other intestinal parasites. The seeds, when combined with equal portions of cumin and sugar, and taken twice or thrice a day, help in reducing the temperature during dysentery. Alternatively, tamarind milk is also beneficial. Tamarind has been associated with treating other ailments and diseases, like fractures, earache, scurvy, body odor, diarrhea, sprains, burns, malaria, blood impurities, inflammation, bleeding piles, jaundice, catarrh, painful and swollen joints, asthma, rheumatism, sunstroke, urinary stones, diabetes, cholesterol metabolism disorders, nausea and vomiting during pregnancy, rashes, leprosy and paralysis. Tamarind has about 239 calories per 100 gm of weight. Tamarind is available as dried pods, pressed fibrous slabs, tamarind blocks, ready-to-use slices, concentrates, balls or in the paste form. It is best to buy tamarind pulp or paste since it becomes more convenient while cooking, compared to boiling pods. Fresh tamarind is found in the markets from April to July, while the concentrate and frozen varieties can be purchased round the year. While selecting mature tamarind, make sure that the pod can be easily cracked open and the pulp is dark brown and sticky. You can also smell the tamarind pulp to check its freshness. The pulp should exude pleasing flavor and a taste similar to that of apricots, dates and lemons. In case you are purchasing processed form of tamarind, pick up a reputed authentic branded packet only. Do not buy old, desiccated pulp or off-smelling products. Store the tamarind pods and compressed blocks tightly packed in plastic bags at room temperature away from heat and light. They last for several weeks. You do not have to refrigerate pastes or concentrates until opening. Once opened, you can freeze the tamarind pulp or paste for up to one year or refrigerate for about six months to retain their freshness and flavor.